If you want to know how to make a sneaker with better traction, just ask a snake. That's the theory driving the research of Hisham Abdel-Aal, Ph.D., an associate teaching professor from Drexel University's College of Engineering who is studying snake skin to help engineers improve the design of textured surfaces, such as engine cylinder liners, prosthetic joints—and yes, maybe even footwear. Abdel-Aal, a mechanical engineer with expertise in tribology, the study of friction, has been collecting and analyzing snake skins for almost a decade in an effort to comprehend and quantify the way they generate friction when they move. In a paper recently published in the Journal of the Mechanical Behavior of Biomedical Materials Abdel-Aal explains how this "natural data" can be ported into the design of commercial products that slip and stick—a process called "bio-inspired surface engineering." "Nature has informed many areas of engineering and design, but tribology is one field of study that has been somewhat overlooked when it comes to learning from nature," said Abdel-Aal. "Snakes in particular have a lot to teach us about optimizing slip and grip. Their existence is dependent on efficiency of motion in very specific environments. The snakes we are studying today are the result of an evolutionary process that has fully adapted the micro-structure of their skin and their body structure to moving and surviving in their habitat from day one. These environments can be brutal on even our most advanced machinery, so applying what we know about snake texturing could help our technology adapt as well." But listening to nature's design tips requires quite a bit of translation. Abdel-Aal's work in this area is quickly becoming the standard for helping engineers unlock the potential of snake friction control for surface design. His most recent research distills the textural traits of snake skin—gleaned from analyzing 350 complete skins shed from 40 different species—matches them with the standard features of textured industrial surfaces and suggests how this framework can be used to synthesize "smart surfaces" with new frictional capabilities. Though it's an ever-present force of nature that scientists, engineers and designers have studied and grappled with as background noise for centuries, when it comes to actually wielding friction for our uses much of our modern understanding remains shrouded in mystery. Part of this, Abdel-Aal suggests, is because our dealings with friction have evolved by constantly trying to negate it with lubricants or maximize it with texture—but almost always in pursuit of on-off goals. Once that specific goal is reached—be it making an engine piston produce a certain amount of horsepower, or a football cleat that works on a muddy field—the work that went into it rarely contributes to a broader understanding of friction. "Design of texture is still viewed as a 'black art' to the effect that currently there exists a gap between available enabling texturing technologies and a conceptual texture-design paradigm," he wrote in a review of functional surfaces. Abdel-Aal notes that such an understanding would not only improve the efficiency of these specific design challenges, but it could also inspire broader use of friction in the design of new surfaces. The guide Abdel-Aal presents takes a lot of the guesswork out of texturing and instead allows designers to make intentional choices—backed by input from the slithering tribology experts. To discern the elements that give a snake its talent for managing friction, Abdel-Aal analyzed his stash of skin samples with the detail, and attention to topography, of a cartographer plotting a map. 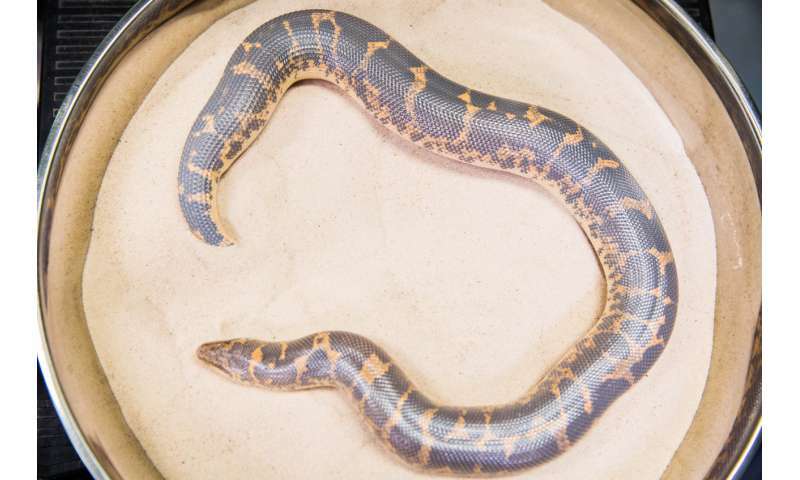 His stock of sheddings started with a few samples from friends with a Royal python and has grown to several hundred with a little help from the Philadelphia Zoo and the Academy of Natural Sciences. It's important to study the skin as the snake would have worn it, so when Abdel-Aal gets a new sample he first soaks it in water, to make it more durable, then turns it right-side out, since most snakes shed their skin like a hastily removed tube sock. Then he mounts it on graphing paper and scans it to create a permanent record with a visual frame of reference. From there he and his research associates can begin making detailed measurements of the shape and size of the scales, and their positioning, relative to one another and about the snake's body. Finally, he examines the skin with a scanning electron microscope to produce an image of the microscopic features that create its texture. Snake scales have invisibly small, hair-like structures, called fibrils. Though they're just a micron in length—about 1/100th the width of a human hair—the fibrils, and how they are arranged on the snake's underside, are key to its ability to generate friction. The positioning of the fibrils, along with the size, shape, stiffness, and distribution of scales create a unique friction profile for each snake—which is what Abdel-Aal has worked to capture and catalogue. With the snake skin "mapped" Abdel-Aal's team can tease out the significant patterns of texture features that all contribute to moving the snake along in its environment. "Adaptation to local requirements requires specialization in shape, geometry and mechanical properties of the skin building blocks," he said. "The implications of adaptation to local conditions are intriguing because they provide a venue for decoding elements of surface design in snakes—such a process has the potential to yield many lessons applicable to the design of technological surfaces." In addition to categorizing patterns of scales and fibril distribution about the snake's body, Abdel-Aal's work synthesizes volumes of research on the physics of snake movement and measures of the forces of friction exerted by the snakes as they undulate, slither, slide and side-wind. By cross-referencing these measurements with the texture profile he created for each snake, Abdel-Aal can relate the physical traits to their impact on the mechanics of the snake. 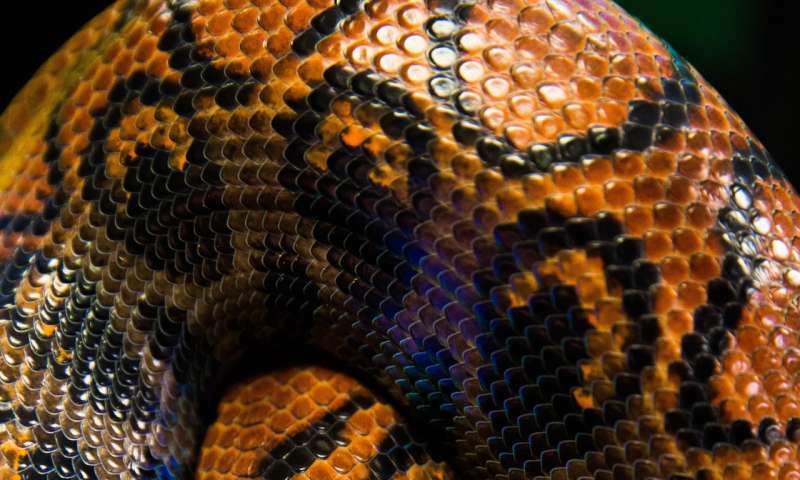 For example, the scale texture and musculature of large snakes, such as boas and pythons has been optimized for rectilinear, or straight-line motion. For this type of movement to occur, the snake basically lifts part of its body and lurches forward by pushing against the ground with sections of its scales. 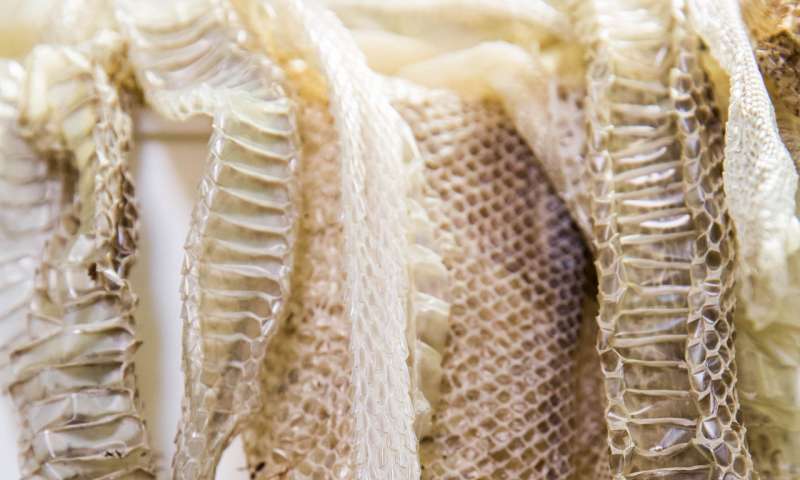 In looking closely at these sections of the snake skin, it's apparent that there are more fibrils on the "pushing" parts of the snake's body, which create enough friction to allow it to slide forward on the other scales. To make a direct relation between the skins and engineered surfaces, Abdel-Aal reviewed research about laser-textured surfaces that conducted a similar microscopic inspection and inventory of surface features. These texturing techniques, such as laser and chemical etching, sand-blasting, and deposition, create surfaces with very specific friction profiles for things like engine cylinders and hydraulic components in machinery. But they share an important detail with the texturing found in nature. "The basic building block in the case of both snakeskin and textured engineered surfaces is a textural element that is repeated in an array distribution," Abdel-Aal writes. "Spacing, length, orientation and shape of denticulation is, in general, common to a particular family of snakes. Engineered surfaces, on the other hand, feature textural building blocks such as cones, dimples, and chevrons, distributed on the surface. Therefore, both types of surfaces share a common constructional origin." The predominant physical features of the textured surfaces are microscopic channels, dimples and protrusions, which are arrayed to ensure consistent friction in a lubricated system. Engineers describe surface textures in terms of the average of the measurements of these features. So "roughness" would be quantified by averaging the height of the protrusions, calculating the total area covered by them, or determining their slenderness by comparing the protrusion's height to the area of its base. Microscopic measurements of the snakeskin's texture features allow Abdel-Aal to make the direct relation between fibrils and protrusions. So the same roughness measures can be applied to the snakes simply by calculating fibril height, slenderness and overall distribution on the scales. This breakthrough, Abdel-Aal asserts, makes it possible to integrate the functional patterning from a snake on engineered surfaces to create textures with predictable behaviors. "For bio-inspired surface design to be effective, we needed to develop a common vocabulary to describe texturing features" Abdel-Aal writes. "We found that three main parameters seemed to translate broadly between the protrusions and dimples of textured surfaces and the fibrils of snake skin: total area of the feature, feature-to-surface ratio, protrusion/height and height-to-base ratio." In classifying the snake skins according to these measures, an interesting pattern emerged. Many of the "recommended texturing ratios" that researchers have found through the production and testing of engineered surfaces are the same that already exist in snakes. "It's striking that engineering research over the last 25 years came to the same design solution, in terms of customization of surface features to promote efficiency of motion, that snakes have evolved over millions of years," Abdel-Aal said. "While it means engineers have probably arrived at the right answer, it also suggests that data from studying snakes could guide us to those conclusions much more efficiently—thus accelerating the development of new surface construction paradigms that can take advantages of the rapidly evolving manufacturing tools." Now that Abdel-Aal's work is allowing engineers to compare surface and snake characteristics—dimples to dimples - some have already started applying it to improve the performance of systems that depend on careful friction management. Collaborators in Colombia designed and tested a surface for a prosthetic hip joint guided by the tribological data gleaned from Abdel-Aal's analysis of Royal Python skin. Based on the work of Abdel-Aal and his collaborators, researchers in the U. K. are developing texturing schemes for tool inserts used in dry machining of titanium. These bio-inspired insert designs maximize friction while minimizing residual heat in the process. And German engineers recently published work on snake-inspired cylinder liners that allow the surfaces to minimize friction whether its moving forward or backward. Abdel-Aal has been publishing his datasets so any engineers could use them. But he also plans to build them into an algorithm that could seamlessly fit into the surface design process. "Constructing bio-inspired surfaces has a broader goal than merely replication of bio-texturing. In essence, it seeks to extend the potential tribological benefits of reptilian surfaces to the domain of human-engineered surfaces," Abdel-Aal writes in the journal. "Although that the field is rapidly developing there is a pressing need for more in-depth cooperation between stake holder communities. I believe this common language between biology and tribology will enable the cross-communication necessary for this cooperation."